Wondering how our hardscape process works?… Here’s the details on our project process from start to finish! With each project we take on at Kansas City Hardscapes, we have a process we follow from start to finish that ensures your project will be created and completed to exceed your expectations. Here’s a look at the details of our process and what to expect when working with our team! Our free estimate appointment is the first step of our process. This appointment consists of a free 45 minute session where one of our designers comes out to your home and meets with you to discuss your project needs and ideas, take measurements, and pictures of your space. Feel free to ask our designers any questions about extra add-on’s, our policies, current project queue, design ideas, and estimated pricing options on materials. Our designers are seasoned pros and they are happy to help answer any questions that they can! Sometimes depending on the scope of the project they can give you an estimated quote you on the spot, but we suggest waiting for your proposal package to get a more accurate quote number. Your proposal package will be given to you around a week or so after your appointment, and it will contain your Proposal, Quote, and a 3D Design—all free of charge. While you do wait and are making your decision of whether you want to proceed, it is important to consider and be aware of how far out our project queue is. Normally for majority of projects (with the exception of a pergola project occasionally) our project queue is about 2-3 months out all year long. So for example if you are having your meeting in October and are wanting your patio by the Spring of next year you will need to move fast in order to get your project on our queue to ensure it will be completed by spring and summer. Other than that though, from there on out it is up to you on whether you would like to work with us and begin the project! No charges or fees will be given until you choose us to do your hardscape! You can schedule this appointment by giving us a call on our office phone (816.499.2547) or by going on our website and clicking the blue “Schedule a Meeting Now” Button and choosing from our available dates and times! Ready to get started? Excellent! We are so happy you chose us to do your hardscape! The next steps of this stage are fairly simple. All that is needed is for you to sign contracts and put down 10% of your project’s total price down as a deposit—we do not charge the rest until the completion of the project! Whether your start date is a short week away or a few months, waiting is a part of every hardscape and construction process—and we know that no matter the amount of time, with the anticipation of your new project, it can be hard to wait! A few great things to do in the meantime would be to prepare your space and finish up anything needed to make sure that when our start date hits, we are ready to begin work! For example, making sure all you have made all of selections for your materials on the project, making sure any needed permits have been obtained or you have given us the okay to obtain them for you (Sometimes depending on the city, there are little to no permits even needed, while others have multiple needed. Our team obtaining the permits is an added service that we charge for, but we are happy to do it for you if needed! See our Permits blog for more on this subject! 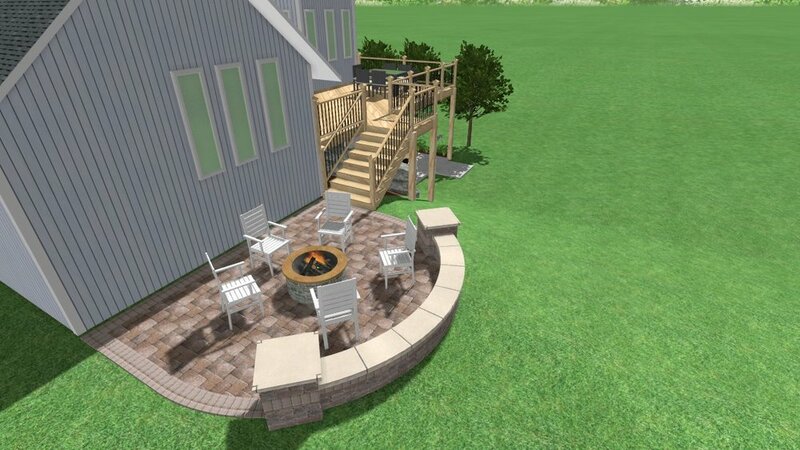 ), find any outdoor furniture a new temporary home (once it gets closer to your start date), researching and choosing a electrician, plumber, or any other additional services needed depending on what your space needs, often Gas fireplaces, fire pits, and outdoor kitchens may need these kinds of services (We can always recommend who we have worked with in the past as well! ), read our blogs to prepare yourself and brush up on possible conditions that may affect the timeline on your project, and lastly, just take the time to get excited about your new space! Additionally, during this time, it is also important to know that weather can be a big contributor to any timeline movement, whether that be a sped up timeline or a stalled one. Especially in the colder months, you may see that our crew could be there for two days one week, and then a whole week the next. 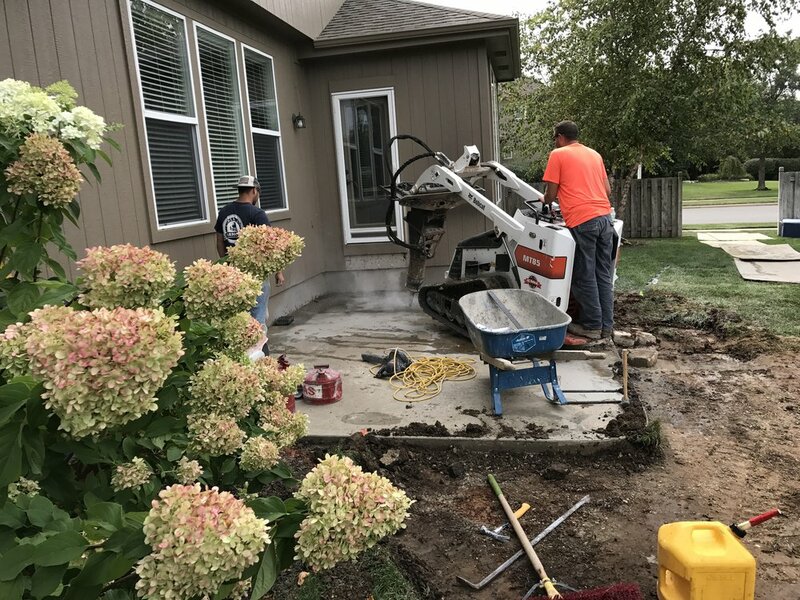 We always try to take advantage of the warmer days at that time, since cold weather can often put a hold on many construction processes such as concrete pouring and foundation laying, but generally we always try to communicate this to you whenever we expect there to be a big change in the schedule. Our construction processes can also be affected by rain, snow, ice, cold temperature, and other similar weather elements, so its likely at least once during your project’s construction we may come into contact with some weather issues which will alter your timeline. We normally try to incorporate some bad weather days into our estimated project completion date, but unfortunately the weather is not in our control and sometimes it can put the process back, not only for your project, but for the client who’s projects in front of yours and behind yours in our project queue. If we finish early on someone else’s project, we will likely try to begin work as early on the next project in line and vise versa with if that project is running later than expected, the next project’s start date will run a later as well. Again, we always strive to communicate any issues and major scheduling changes to you, but it’s still beneficial to know these possibilities of delays prior to the beginning of construction what could happen and affect your hardscape timeline. Now that your project’s construction has began there is little left for you to do in this stage! We will begin our work usually in specialized crews of 2-4 people and work every moment we can during business days until your project is completed! However, if we do run into bad weather, sometimes we will work some extra hours Saturday or on a weekend to make up for any lost days on our schedule due to weather conflicts! Other than that though, sit back and relax while we bring your project to life! Let us know any questions you have, we are happy to help answer them or give more insight on anything you would like to know! Yay! Your project is finally complete! It looks beautiful and you can’t wait to use it! At this point in the process, a few things to left to do at the end of your project would be to consider sealing if you have gotten a paver patio, you can do this yourself or we an do it for you! While this is an additional charge and optional addition we recommend sealing because it adds protection to your patio from the weather elements. The seal helps protect color and texture from sun exposure, rain, snow, excessive dirt, and adds a protective layer between the pavers and anything not weather related than could be spilled, dropped, or scratched on top of it. There are many different types of seals so feel free to ask us which we think would be best for you! Another option to do following the completion of your project is to decide if you would like to upgrade to sod. Depending on your project’s scope, we may have had to use heavy machinery or to excavate. We always try to limit as much damage to your yard as possible by laying down plywood and other things over the top of your grass. However with that said, no matter how careful we are, whenever you use excavating tools on a construction site you will see some cosmetic yard damage to your grass. We try to remedy this and we always lay down grass seeds after we complete a project, which should pop up some beautiful, new grass within a few months (depending on the time of year), but we offer to lay down sod at additional charge if you would like your yard to look as good as new the moment of the projects completion. We recommend sod because its a simple process, your yard will look perfect right away, and its no hassle to you to keep watering and making sure the grass is coming in to your liking. Again, it is completely up to you as it is an optional service and we are happy to give you a price for your yard if you would like to have it done! Lastly, the main component that is still needed to be done would be to pay the last portion of the invoice. 10% of your payment was already paid in the beginning of the project, leaving the remainder due. If you have any questions about what payment we accept, feel free to ask one of our owners when they are on your project site or give us a call at our office phone! Following the project’s completion, we will reach out to you via email to talk about the possibility of us coming back our to your home once more to take marketing pictures of your project space. Usually we do this at least 2-3 months after your projects completion and in the spring through the early fall months. These pictures are taken for our company website, social media channels, and for our portfolio to showcase our work to clients and also to show clients examples of a project or materials that they may be wanting something similar to. The photo sessions typically last 30 minutes to an hour, depending on the scope of the project space and you can feel free to be at home or away during the time of the session. We also provide you with a few of the best images following the session which you can feel free to use as you like for personal use, like social media for example, or many also like to use the images for home insurance purposes. Additionally, we never share any of your personal information when taking the images or posting them, keeping your privacy is our highest priority. Feel free to look on our social channels and website to see and get an idea of what we post! We are happy to elaborate and talk more about the content if you have any questions. We saved the best stage for last—ENJOY!!! Go enjoy your new hardscape! We hope you had a great experience working with our team and we hope you love your new space! Check out the rest of our blogs and social media posts for fun ideas, decorations, and things to do on your hardscape! We hope that this blog has given you some more insight to our process and what is needed from our clients throughout the projects timeline. Although, if you still have questions, feel free to give us a ring at our office phone (816.499.2547) or shoot us an email at hello@kansascityhardscapes.com! We are happy to chat more and further discuss any details about your praticular project timeline! We are not here to turn your home into a construction site this holiday season — We are booked until early spring!